Interdisciplinary collaboration among researchers generally increases productivity, generates higher impact work (Wutchy, Jones, & Uzzi, 2007), and results in the training of more collaborative researchers (Hampton & Parker, 2011). In light of the mounting evidence of the benefits of collaborative research (e.g., Adler & Stewart, 2010; Beaver, 2004; Jones, Wutchy, & Uzzi, 2008; Lee & Bozeman, 2005), it is not surprising that collaboration is increasing across all research disciplines (Jones et al., 2008; Wutchy et al., 2007). Funding agencies and programs are following suit: because research clusters and teams generate high-impact knowledge and research that contribute to solving big open questions, the last 5-10 years has seen an increase in big-ticket research opportunities for team-science (Halliwell & Smith, 2011). 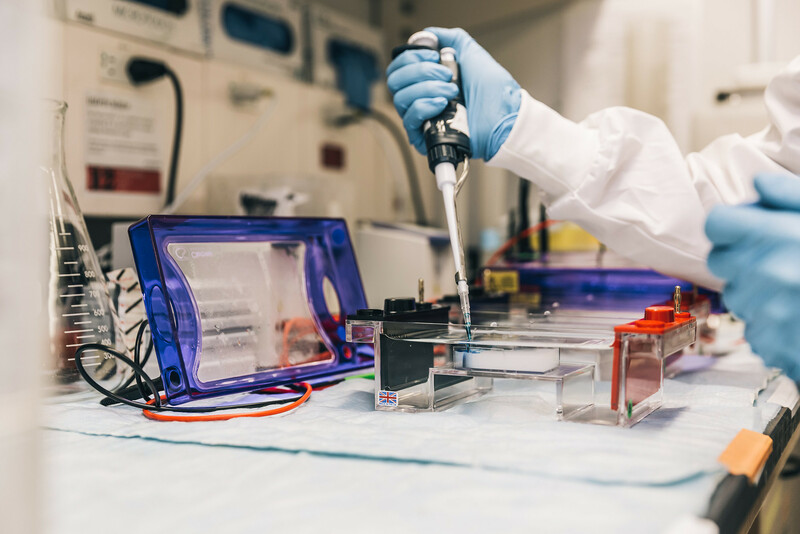 Canadian examples include: Canada First Research Excellence Fund ($1.25B CAD since 2012; CFREF, 2017), Networks of Centres of Excellence ($560M CAD since 2012; NCE, 2017), Canada Foundation for Innovation (CFI team grants, $1B CAD since 2012; CFI, 2017), and dozens of intermediary team/partnership grants through other federal programs. Similar programs are found globally, e.g., NSF Engineering Research Centers (US), Centres of Research Excellence (Australia), and Horizon 2020 (European Union). In all of these granting programs, foundational components of the evaluation and selection process are the level of excellence of the individuals involved (i.e., traditional research metrics) and the strength and cohesion of the team (e.g., proven track-record of the group’s ability to work together as a team). The Canadian NCE program even requires applicants to explicitly justify the synergies of the team that enable the award to have greater impacts than equivalent grants to individual researchers. The role of institutions in these large-scale programs often seems to be reduced to ensuring compliance, reporting, and providing matched funding for large team grants in the form of cash (e.g., Department, Faculty, and Central funds) and in-kind (administrative and reporting support, space, etc.) contributions. However, for the administration and leadership at an institution to enable faculty to facilitate the creation of truly transformative research programs and therefore to be more successful in these competitions, we need to proactively consider how to develop institutional practices that encourage the development and growth of such research clusters even before particular funding opportunities are known. A recent review of the benefits for, and risks to, individual researchers participating in team grants (Canadian Academy of Health Sciences [CAHS], 2017) called for institutions to increase their support and recognition of team science participants. Indeed, establishing and supporting clusters of research excellence now commonly appears in institutional research strategic plans, in one form or another. However, despite a wealth of literature providing researchers with motivation to participate in team science and examples of previous successes (e.g., Adler & Stewart, 2010; Boardman & Ponomariov, 2014; Guise, Winter, Fiore, Regensteiner, & Nagel, 2017; Reichman, 2004; Stokols, Misra, Moser, Hall, & Taylor, 2008), minimal guidance is available to institutions on developing policies and processes to support the development of interdisciplinary clusters of research excellence. Over the last three years, we have piloted institutional support of the development of research clusters. In this paper, we suggest a framework for identifying, evaluating, and catalyzing clusters of research excellence. We describe and justify our approach, providing specific examples of internal processes and analytical tools that we have implemented and end by discussing challenges and early successes of the program, summarizing lessons learned. We hope that this paper will be useful for other institutions and will spark further dialogue about the roles that institutional administration and leadership can play in supporting research clusters. Collaboration is a central theme in our institutional strategic plan (University of British Columbia, 2018) and enabling the development of collaborative research clusters is an identified core strategy. With this goal in mind, we set out to first understand baseline patterns in collaboration in interdisciplinary areas at the University, and then to identify any existing institutional barriers restricting collaborative approaches to research. In this section, we describe our approaches to those challenges and how these exercises were critical in designing our collaborative research support program. In larger institutions with thousands of faculty members, a lack of collaborative research initiatives might simply reflect a lack of awareness of other researchers working on related topics in other departments. To assess this issue, we analyzed the extent of pre-existing collaborations among researchers working on related topics and explored whether or not research clusters would develop organically around interdisciplinary topics following strategically designed networking opportunities. We chose four interdisciplinary research areas that had been identified by a recently established cross-faculty consortium whose mandate is to coordinate interdisciplinary health research and education: Indigenous Health, Mental Health, Ageing, and Diabetes: Lifestyle & Biology. First, we needed to identify researchers across the institution that could meaningfully contribute to research in the four interdisciplinary areas. We started by devising a series of descriptive terms that could be searched through our internal researcher indexing system to identify an initial list of researchers working in each area. For instance, in the case of mental health: “mental” OR “psychological” OR “brain” AND “illness” OR “health” OR “wellbeing” OR “wellness”; “psychology”; “psychiatry”. Examples of systems and databases to search when a centralized search function is not available include: institutional researcher webpages, supervisory records for research trainees, research funding and application tracking systems, ethics application databases, etc. Recognizing that even the most thorough search process misses key researchers (e.g., recent hires; researchers who use only technical words to describe their work; clinicians; digital ghosts), we distributed the draft list of potential researchers broadly among unit leaders to help identify any additional researchers. With a revised list of researchers relevant to each cluster, we were then able to gather evidence of existing research excellence and collaborative trends in each of the interdisciplinary areas, instead of by more traditional organizational units (i.e., faculty, department). To assess research activity and impact, we aggregated traditional research metrics on the individuals (e.g., research funding, major awards, publications, citation impact, media attention/reach). 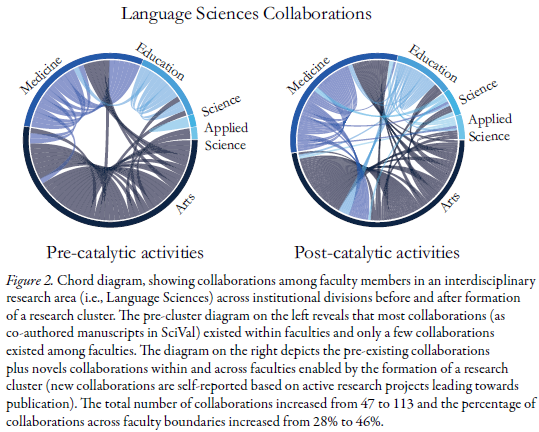 To inform which and how many researchers in the interdisciplinary areas had previously collaborated and whether patterns of collaboration were associated with institutional divisions (i.e., collaborations not happening across faculties), we assessed co-publications among the researchers identified. We used co-publications as a convenient proxy for collaboration because pairwise collaboration data can be mined freely from Web of Science or through third party paid software. However, it is important to note that publication metadata is not likely an accurate proxy in all fields and will be most accurate in fields where publications are the major research output. In circumstances where publications are not the primary research output, collaboration mapping exercises should be supplemented with appropriate data (e.g., co-supervised students, co-PI status on grants, or co-produced exhibits or performances). In the four interdisciplinary research areas that we surveyed, we found that 27-58% of the researchers identified had never collaborated with another researcher on the list (Table 1). Of the pre-existing collaborative links among researchers, only a minority (12-43%) crossed Faculty boundaries (Table 1). To elucidate the processes responsible for observed patterns in collaboration, explore whether significant interest in collaborative research existed, and solicit input on what sorts of institutional support would be needed to catalyze further collaborations, we invited all of the researchers identified to a collaborative research workshop for each of the four interdisciplinary areas. At these working sessions (attended by 22-55% of the researchers invited), we provided networking opportunities for researchers across the University, presented our baseline analyses of collaboration and research activities in the given research area, and discussed opportunities for and barriers inhibiting further collaborations. Participants unanimously expressed excitement towards new collaborations but emphasized that central support was needed to further develop collaborative research initiatives, in the form of seed grants, strategy support, partnership development, and government/community engagement. Our initial scoping of collaborative research activity in the four interdisciplinary research themes revealed that many researchers had already collaborated in these interdisciplinary fields in the absence of formal institutional initiatives, but also highlighted immense opportunity to support additional collaborations within and across faculties. To decide how best to support the development of collaborative research groups, we supplemented the feedback from the four working sessions with broader consultation within our research community (researchers and leadership across faculties) and an environmental scan of support programs at other institutions. Our initial environmental scan of comparator universities found that institutions vary in their definition of interdisciplinary research clusters and consequently in their pathways to identifying and supporting institutionally recognized clusters of research excellence. Most universities define and organize research clusters by disciplines of institutional strength, determined internally or externally (e.g., Simon Fraser University, 2018), while others organize around institutionally identified Grand Challenges (e.g., University of California Los Angeles, 2018) or economic sectors (e.g., University of Toronto, 2018). However, we did not discover a single instance where University support for collaborative research was targeted at providing developmental support for grassroots initiatives and self-organizing research clusters. In spite of this apparent gap, our research community strongly advocated for such an approach and in the absence of model support programs to emulate, we created a novel support program. Through on-going engagement with our internal research community, we settled on a more general (and discipline-agnostic) definition of research clusters as interdisciplinary networks of researchers who organize to solve challenges facing society. Researchers comprising clusters should represent established leaders and rising stars in their areas of expertise working closely together as a unit on complex problems that often transcend traditional departmental, institutional, or disciplinary boundaries. To develop structures and processes that would support the development of such broadly defined research clusters, we described cluster support through a tiered development framework (Figure 1). We first identified characteristics for each tier that should remain true for clusters working on any interdisciplinary research theme and the catalytic activities that would be needed to move from one developmental stage to the next. The catalytic activities identified as essential to cluster development echo the types of support requested by the researchers at the four aforementioned collaborative research workshops. Many of these catalytic activities lie outside traditional academic research funding frameworks (e.g., multi-stakeholder partnership development), are not eligible costs in traditional funding models (e.g., hiring innovation development staff), and are not widely recognized in reviews of scholarly performance (e.g., community engagement). Without strategic planning and institutional resources supporting these catalytic activities, clusters are likely to maintain current research trajectories and run the risk of not advancing further. Our strategy for supporting the development of clusters of research excellence was therefore centered on supporting these activities. Securing funding for catalytic activities can limit cluster development when external grant opportunities for smaller, more flexible awards are not easily discoverable, require developed applications, and/or introduce significant time delays before cluster-catalyzing activities can occur. Furthermore, because the funding required for these activities does not include direct costs of research, we anticipated that relatively small awards could have large impacts on the clusters’ development. Balancing the desire to support the development of interdisciplinary research clusters with the recognition that our university cannot support all emerging research teams, we piloted an internal competition to provide small seed grants to self-organizing clusters: Grants for Catalyzing Research Clusters. In this section, we describe our approach to selecting which clusters to support and the rollout of our development support. While institutions may have well-developed protocols for internal competitions, processes for selecting interdisciplinary research clusters have important nuances that require special attention. For instance, traditional research metrics vary across disciplines, and so aggregate metrics are not often meaningful in the assessment of a single cluster or when comparing multiple clusters. Secondly, it may not be possible to quantify the relative contributions of cluster participants when the group includes a wide range of contributions (theoretical, system specialists, network connectors, etc.) and a variety of roles essential for the cluster’s functioning (e.g., leaders vs. coordinators vs. participants). Furthermore, cluster activities and goals should vary among teams, obviating direct comparison of goals and activities among clusters. Despite these challenges, an evaluation process is required to select which clusters to fund and to evaluate funded clusters over the course of their development. Our approach to evaluation of research clusters has been to focus on broadly-defined criteria where clusters can construct their own cases for fit to criteria, using evidence relevant to their cluster. Inter-disciplinary panels then review applications and score evidence of fit to the criteria and a strong budget justification that aligns specific activities with goals and expected outcomes. Because applications span multiple disciplines, we ensure that each application receives four independent reviews from researchers in several disciplines and with diverse expertise and perspectives. Reviewer scores are then used to guide an in-person reviewer panel where proposals are discussed among all reviewers and ultimately funding decisions are made. Although the cluster initiative, program call, and selection processes were designed with consultation from our research community, the resulting funding program was dissimilar to models that are familiar to most researchers. Therefore, ensuring success of the initiative would require training of potential applicants (in preparing applications) and reviewers (in selecting applications). To increase the likelihood of generating a competitive pool of applications aligned with the objectives of the program, we hosted University-wide information sessions where we provided details on the program and responded to questions from researchers. To ensure that the review panel understood (and ultimately selected applications that were aligned with) the intent of the program, the review panels started with a presentation and discussion about the intent of the program before discussing applications. Shortly after announcing the results of our internal competition, institutional research leadership (i.e., Vice-President Research & Innovation, and Associate Vice-President Research & Innovation) met with the leadership team of each cluster individually. During these meetings, we provided high-level feedback from the panel review process in order to refine and focus the clusters’ proposed measurable outcomes and the metrics that the clusters would use to monitor their progress towards those outcomes. These strategy meetings serve as an important link between the review process and the cluster activities, and open up direct communication channels between clusters and institutional leadership to help clusters achieve their goals. In the pilot year of the Grants for Catalyzing Research Clusters competition, we worked closely with clusters to provide guidance when necessary and to learn from the challenges and successes of individual clusters throughout their award period. After the first round of awards (12 months), we also formally assessed the development of individual clusters and the efficacy of the cluster support program by collecting and aggregating post-award reports. Here, we present our evaluation process, early outcomes of the cluster support initiative, and some reflections on the efficacy of the pilot phase of cluster support program. Because each cluster defined its own goals and expected outcomes in their application to the competition, we based post-award evaluation of their development on their ability to meet self-identified goals. Clusters were given a post-award outcomes report comparing their proposed outcomes and actual outcomes, justifying deviations. They were also asked to reflect on their experiences and specifically to elaborate on successes enabled by the cluster award and any challenges encountered in developing the research cluster. This information was used internally to evaluate outcomes of the financial investment in the cluster pilot program (i.e., institutional reporting and accountability), to better understand the value of the program from the perspective of the researchers, and to identify opportunities for improvement in the cluster support program (i.e., changes to future competitions). This post-award outcomes report is also attached to future cluster grant applications from the cluster—in addition to their novel proposal being evaluated against the competition criteria, reviewers also rigorously evaluate how well outcomes of previous grants were met. Less than three years from the launch of our cluster support program, we have already observed impact on clusters and on our institution. At the cluster level, we have observed successful leveraging of GCRC funds with federal, industry, and charitable sources, increased collaborations across organizational units (e.g., Figure 2), the formation of new external partnerships, the creation of novel lines of inquiry, and (to our delight) researchers have reported an increased sense of community belonging and interest in collaborative activities. We view these benefits to the clusters as benefits to our institution, but additional institutional-level benefits include: increased external funding, increased partnerships and community engagement, high return on investment for internal resources, expanded networking opportunities for trainees in clusters, increased communication and outreach, and early evidence of significant impact on research. While the catalytic activities each cluster undergoes ultimately depend on the goals and expected outcomes of the cluster, our initial competition revealed that most clusters share a few fundamental needs, including: communications support, coordination for networking activities, partnership development, funding intelligence, and strategic guidance from institutional leadership. These support needs can typically be best met (in terms of efficiency and quality) through the provision of centrally managed resources. In the second year of our cluster support program, we adopted a mixed support model that provides both institutional in-kind support and cash awards to help each cluster advance. Below, we describe support for developing clusters of research excellence that may be best met through central provisioning. Coordination: Research clusters universally require coordinated activities among cluster members, and with those activities comes increased administrative burden on the researchers. In emerging clusters, this may be limited to organizing quarterly or biannual collaborative working sessions with the larger group and regular meetings with cluster leaders. In these instances, support can be provided by institutional staff who regularly organize meetings and events or graduate students involved in the cluster (who may have more bandwidth than faculty members for coordination). In established clusters, the coordination activities needed to keep the cluster running productively may require a full-time staff member dedicated to, or hired by, the cluster. Communication: Developing and showcasing an internal and external narrative is crucial to the success of emerging clusters. Nearly every proposal we received in the first cluster competition requested funding to design and operate a web presence. Yet, it is unrealistic to expect an employee to work with each cluster separately: institutions will not likely have the resources to fund the development of multiple separate websites from scratch, and it is not generally sustainable to bring in a personal communications consultant for each cluster. Additionally, there is no guarantee that the web design and quality will match the institution’s standards. Instead, we provisioned the development of a web template for research clusters from our central IT department and supplied the template to the clusters, saving money and ensuring brand alignment. Our central communications teams then provide communications guidance and support during creation of the clusters’ websites and training of cluster members to support on-going maintenance. Partnership development: In large-scale federal competitions, partnerships across sectors are crucial because they ensure that downstream research users co-create research programs, further leverage funding investment, diversify funding sources, and facilitate knowledge mobilization and commercialization activities. For the same reasons, partnerships are essential to the sustainability of cluster activities. However, even the most highly collaborative researchers may work only in the academic sector. For some researchers that comes as a matter of personal preference, but for many others it may occur because of barriers (actual or perceived) limiting cross-sector exchange. Once clusters have identified their goals and challenges, we are able to connect them with staff experienced in those areas, for instance: partnership development officers (to help with partnership development, innovation plans, and knowledge mobilization pathways [e.g., Phipps, Jensen, Johnny, & Poetz, 2017]); Community Engagement Specialists (in situations where community engagement support is required); Research Funding Development Officers; and Government Relations Officers (when provincial or federal partnerships are key). Established clusters may eventually require their own Strategic Partnerships Officer, but centralized support can get most clusters through the first stages of partnership development (strategic planning and engagement). Cross-cluster exchanges and workshops: In the first phase of the cluster support program, we met with each of the teams to discuss individual goals and strategies to achieve them. The individualized meetings were helpful in the early phase of the cluster support program, but required significant time investment from institutional leadership. General strategies began to emerge; for the most recently funded clusters, we instead hosted a workshop bringing together all of the clusters to collectively (1) set the vision for the cluster support program (2) share successes and lessons learned among clusters and (3) discuss the effectiveness of and suggest improvements to the cluster support program. The workshop still allowed for institutional leadership to help guide cluster development, but also provided the first venue for clusters to interact and learn from each other’s challenges and successes. In a post-workshop evaluation survey, participants unanimously supported the workshop model and have asked that we provide additional programming bringing clusters together to share knowledge in areas of relevance to all clusters (for example: partnership development, governance models, and knowledge mobilization). Our institutional approach to supporting research clusters is to identify self-organizing clusters and support grassroots collaborative and interdisciplinary research teams. Through bottom-up processes, natural leaders emerge and, in our early experiences, this is crucial for sustained cluster management and growth. Bottom-up approaches also allow creative linkages to develop that administration could never have imagined, and would never design, (e.g., a violinist and a climate data scientist) and these are the linkages that generate truly novel lines of inquiry. Bottom-up approaches may also have an added benefit of increased participation by trainees and graduate students (though still a preliminary observation, we speculate this may result from organic relationships among researchers). Finally, supporting self-organizing clusters does not require the extensive proactive background efforts by administration that top-down approaches do (see Scoping baseline collaboration in interdisciplinary research areas section above), and the onus of demonstrating research excellence and the merits of collaborative synergies can rest with the clusters themselves. On the other hand, by identifying and promoting areas of priority, an institution can bring additional opportunities and resources to researchers that might not occur without the institutional branding. For instance, facilitating the development of clusters around external priorities or funding opportunities where they are not organically developing otherwise can bring resources to the researchers and institutions that otherwise would not exist. In this scenario, we see the best role of administration as providing strategic support to help mobilize and support the development of clusters in a given research area. Specifically, administration and leadership can assist with connecting researchers across departments/faculties (as described for the interdisciplinary health clusters above), provide examples of frameworks for collaborative research initiatives, help remove barriers to collaboration identified by researchers, and provide incentives to researchers who wish to develop a research cluster in the area of interest (e.g., GCRC competition). Following our efforts to bring together researchers from the four identified interdisciplinary themes, three of the groups submitted an application to the Grants for Catalyzing Research Clusters competition—two of these applications were successful and have started developing a cluster through our bottom-up support processes. Nonetheless, bottom-up approaches to organizing research clusters present their own challenges. Firstly, researchers are rarely incentivized, financially or through award recognition, to pursue cluster activities (Van Rijnsoever & Hessels, 2011). Consequently, researchers may choose to pursue activities that lead to immediate recognition (Landry & Amara, 1998) instead of activities required to organize and manage research clusters, which may be perceived as detracting from publications, grant writing, student training, etc. Secondly, securing the type of funding that researchers need to support cluster growth is frequently a challenge since most important cluster-organizing activities are generally not eligible costs in traditional research granting programs. Finally, the necessity to secure separate funding opportunities for cluster development may significantly delay cluster development (e.g., application processing times and constrained funding windows). The guiding intent of our cluster support initiative is to support interdisciplinary collaboration and catalyze collaborative research across all disciplines. However, our initial competition saw an underrepresentation of applications and funded clusters anchored in social sciences, humanities, and performing and creative arts. To create a more inclusive support program, we worked with researchers and unit leaders from those disciplines to refine the competition call, evaluation criteria, and review process. Indeed, these refinements resulted in an increase in clusters led by researchers in social sciences and humanities and, to a lesser extent, the performing and creative arts. However, we still see an underrepresentation of clusters (and proposals) from humanities disciplines. We are continuing to work with faculty and leadership in the humanities and are piloting pre-cluster support to proposal leads from humanities disciplines, but it is important to recognize that a single cluster support program may not ever be able to be fully satisfy the support needs of all interdisciplinary research initiatives. As we continue to encourage scholars from underrepresented disciplines to participate in and lead research clusters, we have also begun to explore additional funding models that may be better tailored to supporting collaborative work in humanities. We recommend that leadership at other institutions regularly engage with researchers in all disciplines to ensure that collaborative research support programs at their institutions are not inadvertently excluding particular disciplinary expertise. In the early phases of designing and implementing the cluster support program, we were not certain to what extent we would be able to measure tangible impacts of the initiative within and over what timescale, and so our outcomes reporting was dependent upon clusters’ self-reporting their ability to achieve proposed goals and expected outcomes. On the other hand, continuing to secure internal funding for the program requires empirical evidence of significant return on investment of the seed funding. We are currently designing a more comprehensive reporting process that will include the assessment of whether major goals were met, but will be supplemented by a structured report on discrete outcomes (e.g., leveraged funding, knowledge translation activities, and new partnerships) and a qualitative impact narrative. This expanded reporting, complemented with analyses of institutional trends (e.g., changes in collaborative publications as seen in Figure 2) will facilitate clear articulation of the value of the institutional investment in supporting collaborative research. We now have sufficient evidence demonstrating the success of this pilot program. The next major challenge will be transitioning from a pilot program to an on-going support model at the institution. This will include addressing several unanswered strategic questions, including: How many clusters should the institution be supporting? What is the right balance of support to allocate between newly emerging vs. well-established clusters? Which resources are best provided centrally vs. via funding directly to clusters (e.g., communications support, partnership development, collaboration facilitation)? At what point are clusters expected to no longer rely on central resources for development? Over the next year, we will focus on addressing these strategic decisions in order to develop a plan for the post-pilot phase of the research cluster support strategy. The development and implementation of the initiatives described above were community efforts and we are indebted to a number of individuals and offices at UBC, particularly: the Associate Deans Research, the offices of the Vice-President Research & Innovation and Provost & Vice-President Academic, and Faculty members leading and participating in research clusters. We also thank Janet Halliwell, Dawn Whitworth, Jonathan Pruitt, and two anonymous reviewers for providing constructive feedback on early drafts of this manuscript, and Dmitriy Ryabika for analytical support in collaboration mapping activities. Funding for our initiatives to support clusters of research excellence has been provided by the UBC Excellence Fund. An earlier form of this paper was submitted to the 2017 Society of Research Administrations International Symposium. Networks of Centres of Excellence of Canada. (2017). Proactive disclosure. Retrieved from http://www.nce-rce.gc.ca/Disclosure-Divulgation/Index_eng. Phipps, D., Jensen, K. E., Johnny, M., & Poetz, A. (2017). Supporting knowledge mobilization and research impact strategies in grant applications. Journal of Research Administration, 47(2), 49-67. Reichman, O. J. (2004). NCEAS: Promoting creative collaborations. PLoS Biology 2(3), e72. https://doi.org/10.1371/journal.pbio.0020072.